Android OS currently features over three hundred millions of devices running their software and, this year we should see the addition of a new system version for Android-based devices which has been code named 'Jelly Bean'. Later this year at the Gooogle I/O summit, that is expected to take place in the Q3 of 2012, we should see the release of the new Android 5.0 Jelly Bean OS and the developers released a few screenshots. 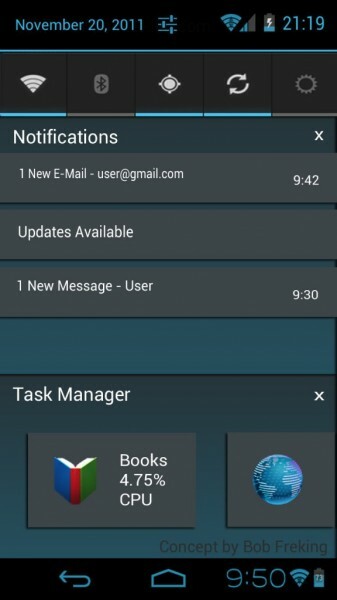 In this pics you can see the new Android 5.0 interface and the UI that was created by Bob Freking. It will be first available for the Google Nexus Ultima and Motorola Nexus Razr 5. It has been reported that as of February 2012 there are over eight hundred thousand devices activated every day and this means that Android is world's most popular smartphone OS and soon we will be able to experience the Jelly Bean OS for ourselves. However, until then you can check the pics posted in this article and make an idea of what Jelly Bean will look like. The Android 5.0 Jelly Bean OS will have incorporated support for netbooks and dual boor which means that you will be free to install Chrome OS. The theme and design used for this new OS aren't that much different than the Ice Cream Sandwich version. This new design allowed developers to create a new notification bar that should be much more user-friendly and it also replaces the recent apps button. Despite the fact that Android 5.0 won't be much different from ICS, you should still expect it to perform way better and with tons of new features being added and released along with future Android-based phones and tablets. Android and Google need to create and bring new features along with the upcoming OS in order to battle the iOS and Windows Phone operating systems. The best new integration will be the Google Chrome that should be automatically integrated with the OS and this means that Chrome will be to Android just like Safari is for iOS and IE is for Windows phones. It should come packed with a new keyboard interface that should help tablet and phone users easily type text messages, write blog posts, create to-do lists etc. However, despite all the new features and apps that will be packed in Jelly Bean OS there is another thing that will make it one of the best ever release operating systems, since it will be available as a Lite edition also. This means that you will be able to use the new Android 5.0 on cheaper or older devices for everyone to experience it. Toggle switches that will allow you to turn Bluetooth ON/OFF, GPS, Wi-Fi etc. It is expected that the Jelly Bean OS will be packed with a better security system that will protect your device against any malware attacks. These were the most important facts about Android's future release and we can't wait until the 5.0 Jelly Bean OS gets launched to test its capabilities and functions to see if it stands a chance of becoming one of the best ever released operating systems for smartphones and tablet computers. If you have some insight or new info about Jelly Bean or the Chrome OS dual boot support then please let us know by posting in the comments section.